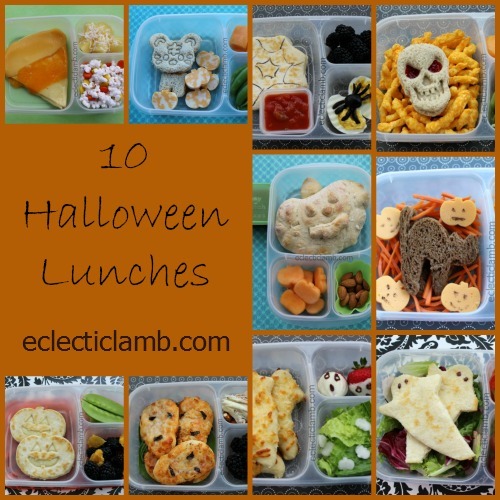 Today I am sharing 10 new Halloween lunches. I made these for my husband, friend’s daughter, my Mom, my Dad, and myself. 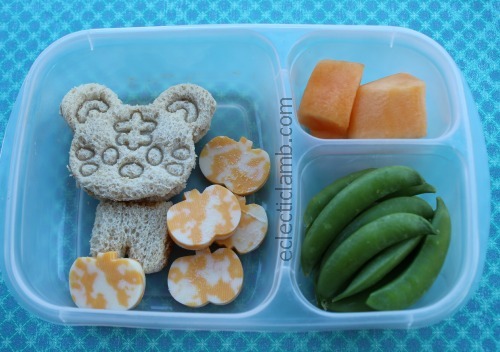 I enjoy making cute food for anyone who will eat it and luckily I have no trouble finding volunteers. In this article, I feature quesadillas, pizza, sandwiches, and a calzone. I made this spider themed lunch for my Dad since I knew that I wanted to make a deviled egg and he likes them. 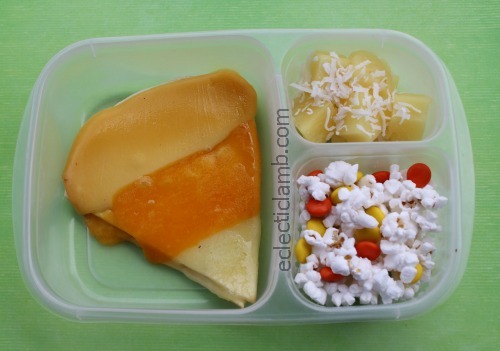 I made this candy corn themed lunch for my Mom. I modified the recipe a little to make it more crispy than the original recipe. 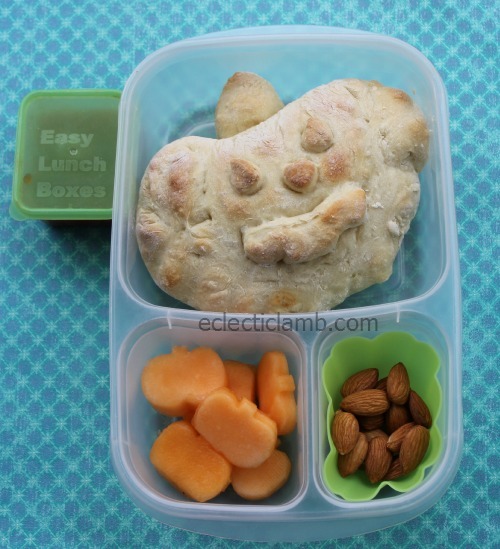 I made this friendly ghost lunch for myself. The picks were from Lindt Halloween chocolates. I made this Jack-o-Lantern calzone for myself. It was so much fun to make and eat. Top: Calzone made with pizza dough and filled with ricotta cheese, spinach, and a lot of pepper), I cut pumpkin face details with cookie cutters. I then baked it. 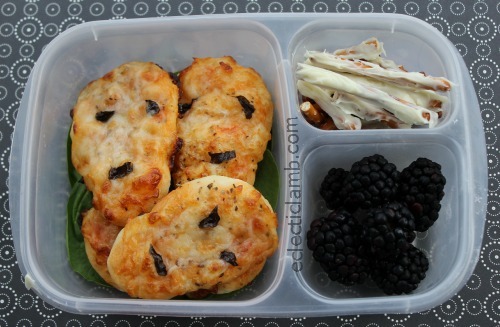 I made this simple lunch for myself using CuteZCute Cuddle Palz. My husband ate this pizza ghost lunch. He especially enjoyed the ghost strawberries. Top Right: Strawberries with white candy melts and semi-sweet chocolate details. I was inspired by this. I made this for myself because there was no one else around on the day that I wanted to make it. Skulls are not my favorite but I am very pleased with how it tasted and looked. I was inspired by Organized Bites to put Trader Joe’s Baked Cheese Crunchies behind the sandwich. When I asked my friend’s daughter what type of Halloween bento she wanted, she said “black cat”. I was happy to make this lunch for her. I made this skull pizza meal for husband. I added the “bones” because he likes chocolate covered pretzels. 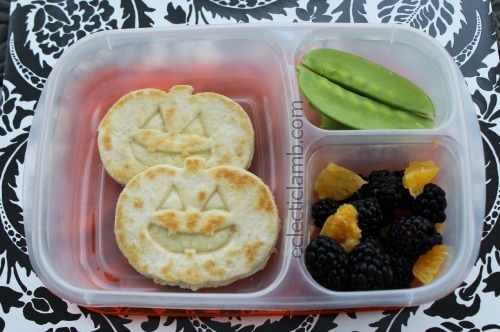 I made these happy Jack-o-lantern quesadillas for myself. Left Side: Jack-o-lantern cheese quesadillas (I cut the face out of one side using a Jack-o-lantern cookie cutter, I then browned it by itself on my stove with cooking spray on the pan. Afterwards, I cooked the pumpkin shape with cheese and the cooked Jack-o-lantern cut-out on top at low heat until melted. 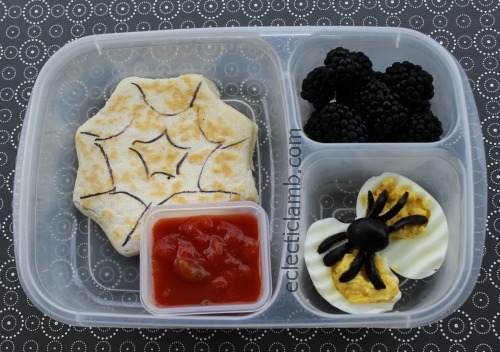 I hope that you now have a few Halloween themed food ideas to make in your own kitchen. Enjoy! 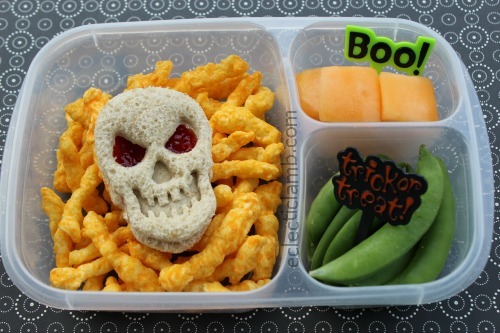 This entry was posted in Bento / Cute Food, Food and tagged bento, halloween. Bookmark the permalink. 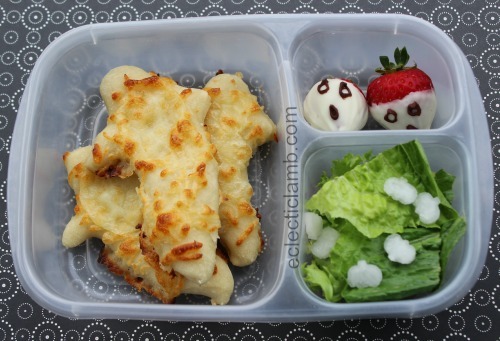 Wow, what a fantastic selection of fun lunches! My little man would love that. Going to pin a few images to my Halloween board, thank you for the inspiration! WOW! You’ve been BUSY! Love all the chooses and the colors! FUN faces, too! Very inventive! I enjoy Halloween! 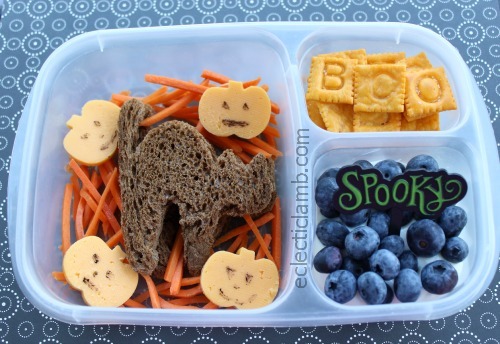 All of your Halloween lunches look brilliant! 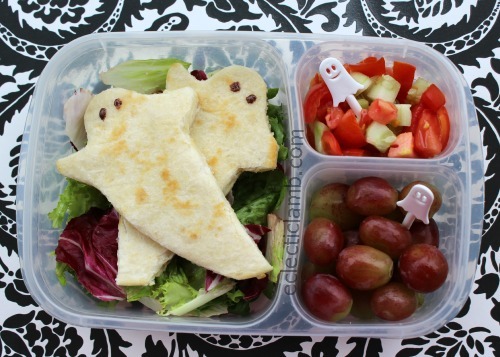 I love the friendly ghost one, and that skull sandwich came out fantastically.